No-Sew Bicycle Skirt Guard Tutorial! | Hideous! Dreadful! Stinky! No-Sew Bicycle Skirt Guard Tutorial! I have been wanting to make a skirt guard for my bike for a long time, and what better time than during the Summer of No Pants?! Skirt guards are fairly common in Europe, but you don’t see them that often here in the States. As the name implies, a skirt guard helps keep a long skirt (or coat) from getting caught up in the spokes or brushed against a dirty rear wheel. I shopped around for awhile for the perfect skirt guard, but never came across an affordable one that I just loved, and the tutorials that I found looked like they would work, but were not pretty enough for my gorgeous bike (by the way, if you are wondering about the bike, it is a Nirve Wilshire, and I love it!). So after sitting in my thinking chair for a spell, I came up with this skirt guard tutorial! 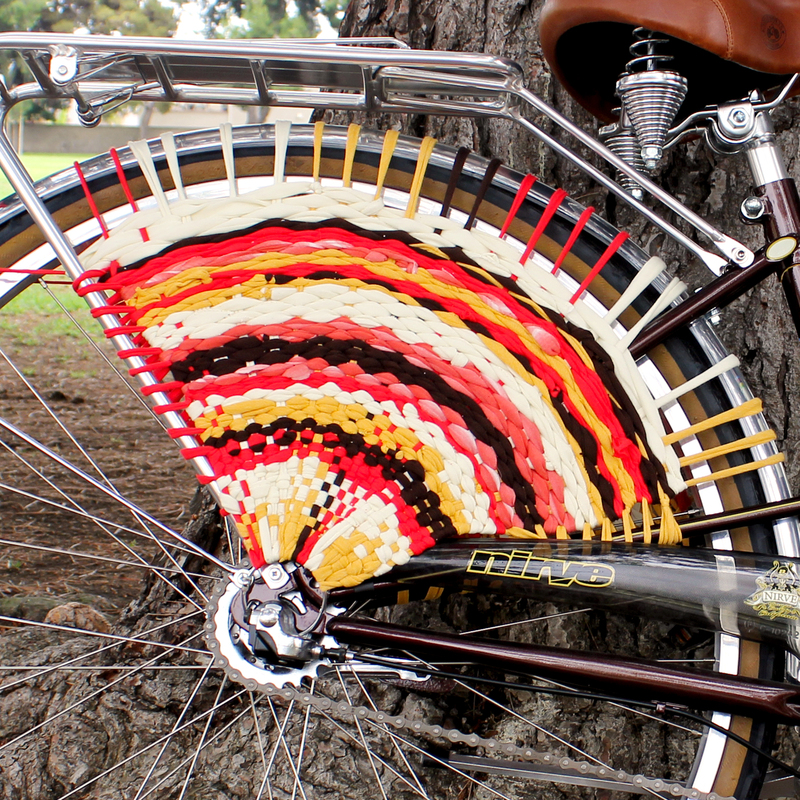 It’s made from t-shirt knit fabric, but it is no-sew, and you don’t have to punch holes in your fender to make it work. Check out the full tutorial after the jump! Before we get started, please note a few things: For the purpose of this tutorial, I’ll be talking exclusively about the rear wheel. The “left side” refers to the side without the chain, and the “right side” is the side with the chain. Hang the metal shower curtain rings on the rear wheel nut on the outside of the bikes frame. On the right side (chain-side) of my bike, I have a gear shifter box thingy. I hung my metal ring behind that (I had to open the ring up) but still off of the nut in front of the frame. Cut several strips of t-shirt jersey into 1″-2″ strips. I used a few plain colors, but patterns or graphics on t-shirts could lead to some fun and interesting color combinations. Loop one strip of fabric around the metal ring and tie the fabric to itself a few inches up from the ring. Stretch the strip taught and bring it over the front side of the fender and down to the other side of the wheel. Loop under the metal ring and pull the strip up again and over the fender back to the first side. Continue looping the fabric over the fender from metal ring to metal ring. Stretch the fabric so it is taught, but make sure it is not so tight that you are bending the fender and making it rub against the tire. When you run out of one strip of fabric, tie another strip fabric to it to make a long, continuous string of fabric. Make sure your knots are secure! Keep looping from one side to the other about 2″ apart until your strip is about parallel with one of the metal stays in the rear – usually either for the fender or the bike rack. On your final loop, tie the fabric to itself a few inches up from the metal ring. You’ve just completed making the warp of your woven skirt guard! Your wheel should now look like something like this. It’s time to start weaving! You may want to cut some more strips of fabric. Tie a strip of fabric to one of the outermost lines of the warp fabric. Slide it down close to the metal ring. Leave a bit of a “tail” on the short end. Begin weaving in and out of the warp fabric. Weave the loose “tail” in, as well, and make sure to tuck it behind the woven lines. Continue weaving, tying on new strips of fabric as necessary, and tucking loose tail to the back. Don’t weave too tightly! You’ll want to be able to stretch this out later. Weave all the way to the about the rim of the wheel. You can go up a little higher, too, if you like! Now we’re going to stretch the woven bike guard out and attach it to the frame of the bike. Loop a strip of fabric through the outermost warp strip and around the bike frame. Tie a secure knot. Start looping the strip through the woven skirt guard and around the bike frame. Pull tightly and evenly and finish with a secure knot. Do the same on the back side of the skirt guard, attaching it to either your bike rack, if you have one, or to the fender stay. Here’s what it should look like when you’re done! Now do it again on the other side! Bada bing! Here it is on the chain side! And here’s what it looks like when you step back. Pretty sweet! And that skirt? Yup, I made it. And I used some of the left over fabric in the skirt guard, so it matches perfectly when I ride. If you make one, I’d love to have you share a link to it in the comments!